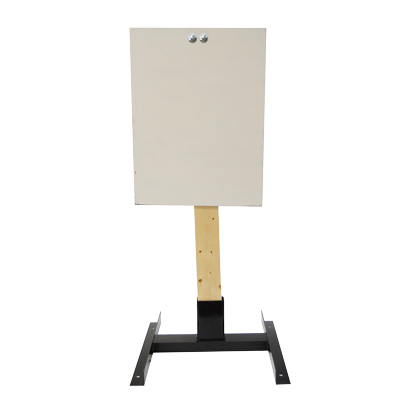 This Steel Challenge target comes with a standard duty AR500 18x24 steel plate attached to a bracket that mounts to a 2x4 wooden stand. The plate uses a bolt and spring to enhance the "ring" effect for maximum feedback. The base includes a bracket that utilizes thumb screws to securely hold the 2x4 stand. 2x4's (not included) can be cut to any height to suit your needs. Collapsible and lightweight, you can add several to your range using different height 2x4's to create a fun and challenging shooting experience.